Is this really that controversial? You are reading page 2 of Is this really that controversial?. If you want to start from the beginning Go to First Page. Document the interaction that happened. Take notes. Names, date, place said. Either way, sounds like a bad school. Are you selling your body? Dealing drugs? Racing the General Lee and running from Hazzard County Sheriff? If not, what you do on your time is your business. if anyone wants to know my address, turn right at the country store. Turn off the paved road. When the road gets real screwed up, make a left and put it in 4HIGH. Follow the hills to my ranch. Rev your motor so me and the dog will hear you coming bout a mile down yonder. I always tell people I'm going to become both an RN and mechanic. Mix blue collar and scrub collar. I've met some interesting people in the same fields. But no one sees me do it in the forest. I don't have any convictions pending. No criminal record. I don't do anything that would ruin that schools reputation. A bunch of nursing students work as bartenders and /or wait staff during school. The hours are student friendly and the tips are a vital income booster, especially since I've never heard of anyone reporting their tips accurately as taxable income. Unless you are dancing on a bar naked I doubt if the morality police would care if you are bartending. I am a nursing student, a CNA, and a bartender. Customers often ask me if I am in school and I have no issue sharing that I am a nursing student. Bartending pays better than being a CNA so I do both so that I can pay for school and gain clinical expereince. I agree nursing students should not be out at the bar with their uniform on. Nurses are professionals and real people, but personal life should be separate from professional. Alcohol should never be used in a way that impacts work or school performance. Nurses preform high risk tasks every day and make critical desicions. zoidberg has 4 years experience as a BSN, RN. 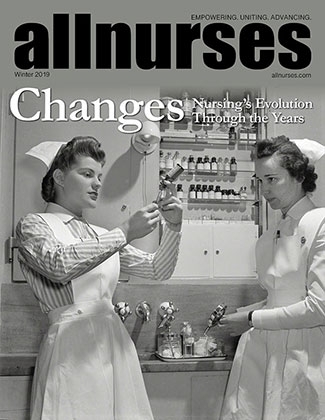 I think the different attitudes seen on here between nursing students and nurses are due to the fact that all of us nurses have been burned or creeped out after we reveal too much, so now we maintain that professional guard at all times, even out and about. I often do not give up my profession or where I work easily. It is just easier that way. While nursing is rewarding and I have met a great number of patient that inspire to be a better nurse, there are also tons of people who I would not want them to know I am a husband and father to a family living 5 minutes away. PSA -- the creepy people are usually the ones you see in the grocery store and have to slip down the next isle extra quick before they see you. I'm a server and it is paying for my college for sure! In a few months I've managed to save up almost every mortgage payment I'll have while I'm in nursing school. I often talk with people about what I'm doing - most ask why I'm waiting tables - I tell them its because I'm in school preparing for nursing school and it certainly pays my bills. More often than not - I actually get better tips because of this. I don't tell everyone - just sometimes you sort of click with people. Its a feeling - just like when you wait on scary people... one day I had someone ask me if I could walk outside and take their picture - flat out told them I wasn't allowed to be outside. Wasn't totally a lie - but I'm not sure I would have ever walked back in that door had I walked out of it. I wouldn't ever wear my nursing garb to work - just like I wouldn't wear my working garb to school or anywhere else. We wear all black and I don't put my shirt on until I'm walking in the restaurant. My life stays separated. I'm a server and it is paying for my college for sure! In a few months I've managed to save up almost every mortgage payment I'll have while I'm in nursing school. Good for you, serving is a practical job for students! After working crazy hours for a couple of years, I have saved up a good chunk of cash. With the help of scholarships (and living rent free with my parents), I will graduate without debt. Serving teaches you about proritizing and how to work with customers and coworkers--important "soft skills" for nurses to have. I think that a lot depends on the school. There may be some ultra-conservative faith-based schools that would consider their students' personal lives to be relevant ... but I think that the majority of state schools would be careful not to discriminate against any student on the basis of their personal beliefs or lifestyle (assuming they are legal). I've know lots and lots of nursing students who have worked in restaurants and bars where alcohol was being served and never heard of any of them having any problems. But like many of the experienced nurses, I would recommend to students that they keep their school out of the bar. Keep them separate - just as a safety precaution.